As an aside, I recently purchased items from Summit Racing in USA. Customs held up this shipment again seeking details for Asbestos testing. The shipment consisted of an in line fuel filter, bypass valve, ignition controller and some wiring. After nearly two weeks, I have them down to one item. The bypass valve states that it comes with a gasket. Yes they want the Safety data sheet and chain of delivery for the gasket? Great, I've just ordered a MagnaFuel inline fuel filter and pump bypass from Summit as well. Thanks for the heads up. Hopefully my order gets through with no drama. Will keep you posted. Edit: Couple of months ago I received a set of brake pads from Summit with no problems. Last edited by TUFF68; 15-05-2018 at 09:02 PM..
Just last night someone was telling me that a friend imported a genuine Shelby Mustang and customs took it to pieces looking for asbestos engine gaskets and brake material. They found nothing but gave it back to the owner in pieces long with a bill for their trouble ! Yes, I have heard about the Shelby as well. I was reading in unique cars a few maseratis destined for a car show were stopped at customs and not allowed to leave the docks. I think the looneys ae taking over the asylum ... a mate has a rental property and needed to get a broken window replaced. He called Obrien Glass and when he told them it was an old house with painted wooden window frames they wouldn't do the job until they sent out an inspector to check for lead in the paint. To do that alone was $800 !! plus then the cost of fixing the actual window. What is going on ?!?!? Thats harsh frank . I would seriously doubt the lead in the paint if any would pose a risk to anybody just another way to screw people methinks. Knew a guy who repainted his house. The lead in the old paint killed him. Dangerous stuff. Really ? He would have had to ingest quite a bit of lead wouldn't he ? Just from breathing the dust from the old paint ? Last edited by Frank351; 23-05-2018 at 01:43 PM..
Well these F#*kers better get their sh1t together, I've decided that given I'm moving to an acre, I' buying and hot rodding a 1967 112 John Deere Round Fender. I've been looking at a few last few weeks. They are nearly all metal, but they do have a head casket which may be an issue. My plans. 35Hp V twin (standard is a 10hp single cylinder), fully chromed. 10" wide rims (yes you can buy em, the one in the pic below are 9.5" rims - that's 10" wide, not tall. Large sidewall rears, smaller front give it that old school bigs / smalls look. Candy apple red paint twin chromed exhausts black under carriage. I can pick up a crappy one for $400 US. I'm looking at a decent runner for $800 US right now. You may have to get some type of certification regarding the cleaning if it has come from agricultural use. If you reckon they are hot on asbestos........ they are not very happy to see any form of vegetation, dirt etc. Lol your a man of many tastes Chris. 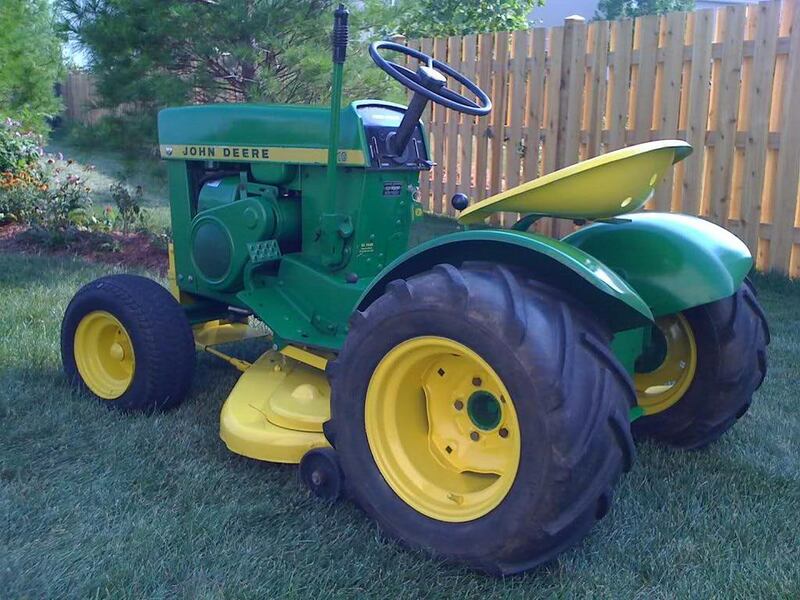 I just bought a 26hp $8k John Deere. I think I should have gone your way . Must be exponential $ increase for tractor hp. I have a 36hp JD and it was a bit more than 8K. 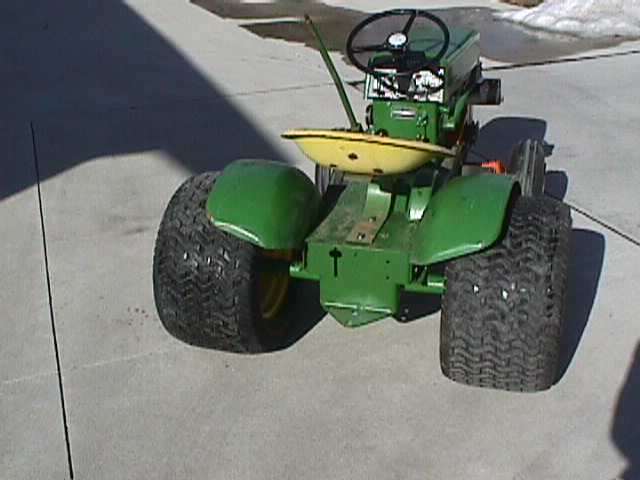 I looked at Quads & mowers from the US but got scared of the cleaning issues.